Pink Punch Lemonade, Wild Watermelon Lemonade, Strawberry Crush Lemonade, Banana Oatmeal Cookie, Frosted Sugar Cookie, Honeydew Melon Chew, Tropical Pucker Punch. 60ml bottles or 2x60ml packs. 0mg, 3mg, 6mg. 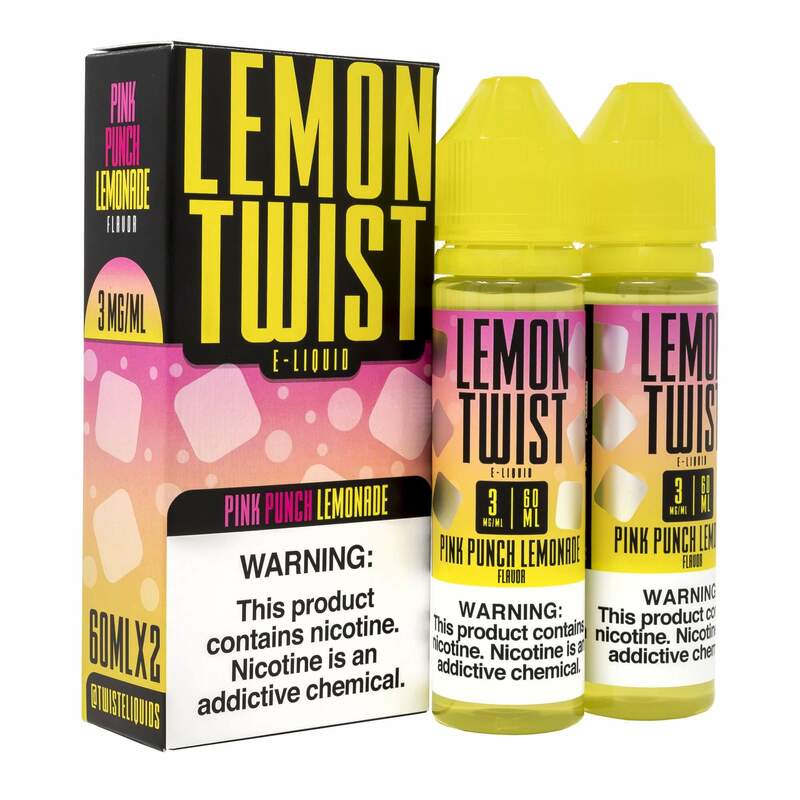 Pink Punch Lemonade – Pink Punch Lemonade 120ML Lemon Twist By Twist E-Liquids is freshly squeezed lemons with a tart mixed red berry fusion vape. Wild Watermelon Lemonade – Wild Watermelon Lemonade 120ML Lemon Twist By Twist E-Liquids is the summertime favorite vape, sweet watermelon and tart lemonade. Strawberry Crush Lemonade – Strawberry Mason Lemonade 120ML Lemon Twist By Twist E-Liquids is fresh squeezed lemonade combined with sweet muddled strawberries to provide the perfect vaping experience. Frosted Sugar Cookie – A light and airy, almost cake-like confection, topped with warm vanilla frosting and sprinkles! Honeydew Melon Chew – Honeydew Melon Chew 120ML Melon Twist By Twist E-Liquids is a a blend of honeydew and cantaloupe melons with a real sweetness to provide the perfect vape experience. Tropical Pucker Punch – Tropical Pucker Punch 120ML Fruit Twist By Twist E-Liquids is a special vape flavor consisting of a secret blend of exotic fruits.